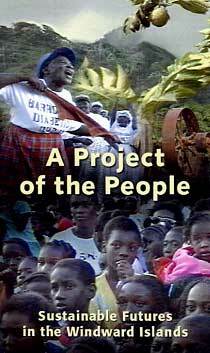 A Project of the People explores the evolution of a development project which takes place in the Windward Islands of the Eastern Caribbean. Local people are creating a new kind of tourism – "nature tourism" – which draws on the strengths of their communities, their cultural roots, and their spectacular natural environments. This is the story of a participatory, grassroots process that has been taking place over the past six years in Dominica, Grenada, St. Lucia and St. Vincent. It is told by village people determined to create sustainable futures for their communities. This documentary was made by the Canadian team who facilitated this unique self-organizing project. It takes us into the lives of Caribbean villagers who are seeking their past, strengthening their culture, protecting their environment, and improving their economic situation. They are working together to invent their own futures. A Project of the People draws mainly on the commitment, energy and passion of the villagers. Their words and the settings they have created provide intimate insights into the power of small rural communities in the Caribbean to help themselves. The dramatic mountain and coastal scenery of the Windward Islands provide the backdrop to this intense expression of community energy and determination. Their voices weave the narrative of their thoughts and enthusiasm.